Professional’s Choice Comfort-Fit SMx Air Ride Pad Quartz. Tuotenro CXHDQTZ-33. Professional’s Choice Comfort-Fit SMx Air Ride Pad Quartz, anatomisesti muotoiltu satulapatja, hevosta vasten merinovillaa, päällinen villaa, välissä ainutlaatuinen SMx Air Ride materiaali, padin koko 33″x 38″, pituus noin 83 cm. Developed from the horse’s back up, the Comfort-Fit SMx Air Ride Saddle Pad is contoured to follow the curve of the horse’s spine. As a result, the pad locks in place on the horses back, allowing full movement. 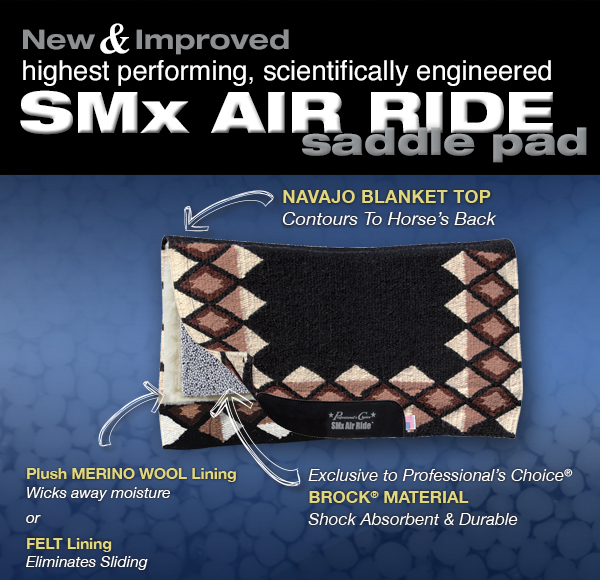 The SMx Air Ride core absorbs shock and improves saddle fit for ultimate equine comfort. The Air Ride core is made of a unique material found in the protective gear of professional human athletes for absorbing shock while allowing air flow to the skin, creating a natural cooling system that lowers the horse’s body temperature and slows the rate of fatigue. Fleece lining. 33″ x 38″ 3/4″ Core – Heavy Duty. The Professional’s Choice new and improved SMx Air Ride Saddle Pads feature a brand new core that provides 12% more energy absorption and 5% greater pliability, making them more comfortable than ever! This revolutionary pad works to protect your horse’s back by absorbing negative energy and dispersing it over the entire pad, preventing uncomfortable pressure points. In addition, this latest version of Air Ride technology now allows up to 50% more 3-D airflow to keep your horse cool, slowing the rate of fatigue.